Home World Middle East SYRIA ON THE BRINK OF A DEMOCRATIC REVOLUTION? The Baathist dictatorship in Damascus appears to be on its last legs as the rats start to bail out of its sinking ship. Driven to the edge with the liberation of Iraq by the brave trio of President Bush and PMs Blair and Howard, the crazed leader of this backward nation threw his last roll of the dice when he ordered the assassination of Lebanese freedom fighter Rafiq Hariri. But now Assad is under the stony glare of President Bush, and his offsiders have seen the light and are starting to abandon him. It won't be long before the long suffering people of Syria rise up and, with help from the freedom-loving west, throw of his shackles once and for all. 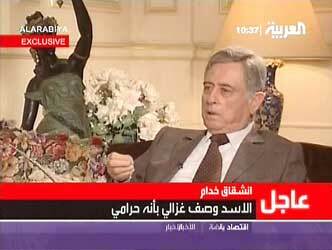 Abdul-Halim Khaddam has been interviewed on Arabic TV and spilt his guts. Syria's tyranny will end soon. But will the latte sippers of the left stand with the people of Syria against tyranny? Don't bet on it! Their fantasy-filled vision of the world is fuelled by their hatred of America. They will see conspiracy where none exist. Please you people, many of you have university degrees, why do you hate freedom so? It is not such a bad thing to bend your knee to men like President Bush and PM Howard. They are truly men among men; there is no shame in supporting them! They have allowed the downtrodden of Arabia to get the taste of freedom. We will all benefit. There will be peace, prosperity, and the ability to visit our holy places free from intimidation. This week, the Times of London detailed the use of a human shredding machine as a vehicle for putting to death critics of Saddam Hussein. This is the man, this is the apparatus of terror we are dealing with!